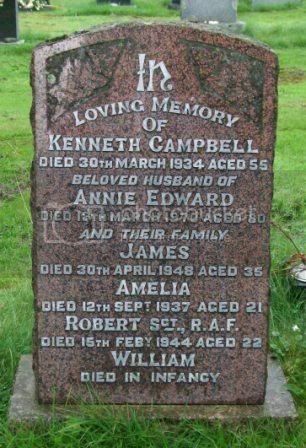 Additional information: Son of Neil and Annie McGregor Campbell; husband of Christina Campbell, of 9, Chapel St., Aberfeldy. 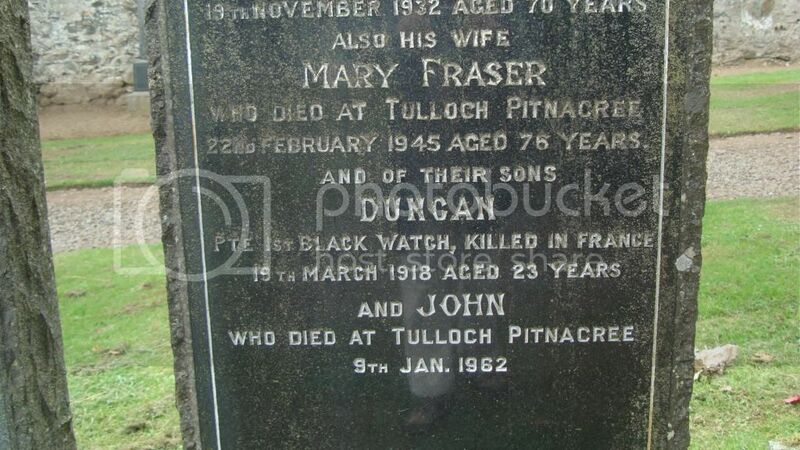 Additional information: Son of Donald and Janet Fisher. Born at Aberfeldy. 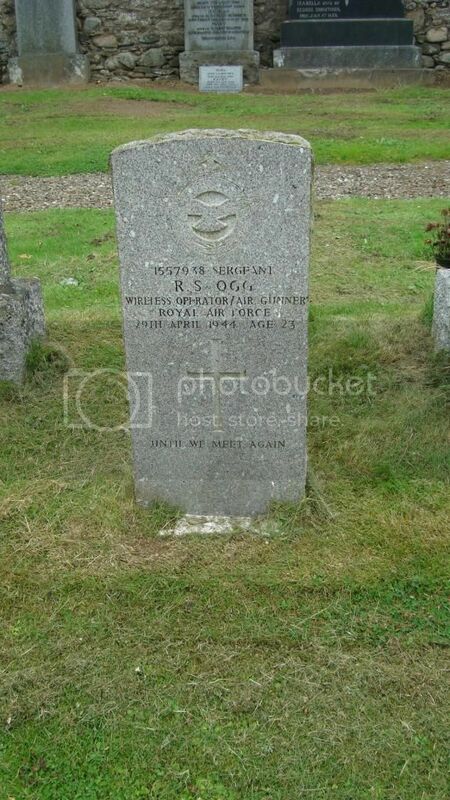 Additional information: Son of John and Helen A. Ogg, of Aberfeldy; husband of Madge Eunice Ogg, of Glenfield, Leicestershire. Grave/Memorial Reference: Row B. Grave 493. 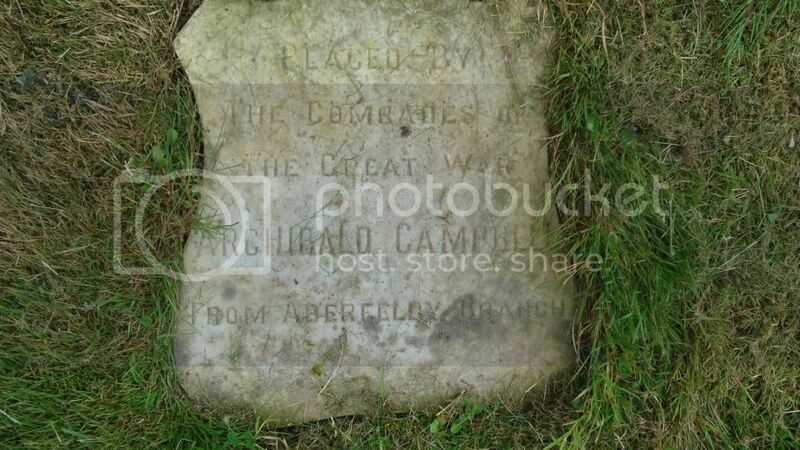 Additional information: Son of Kenneth and Annie Campbell, of Aberfeldy, Perthshire. Grave/Memorial Reference: Allied Mil. Plot. Row 4. 10. 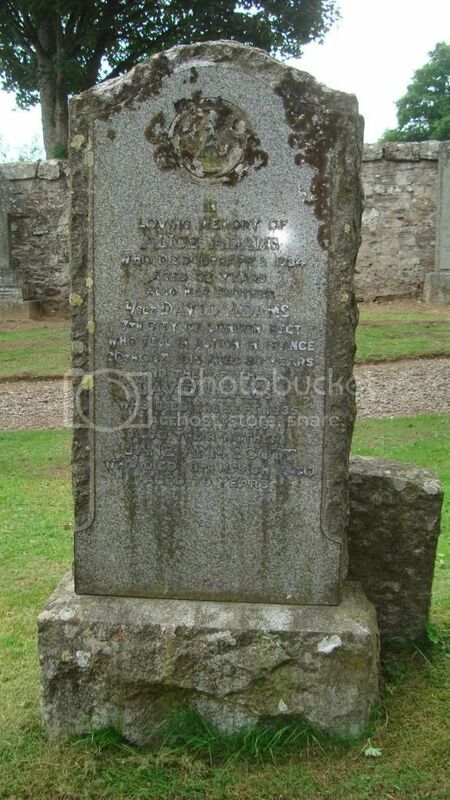 Additional information: Son of William Rattray and of Elizabeth Rattray, of Aberfeldy, Perthshire. In loving memory of William MacDonald, Builder who died 28th Oct 1925 and of his wife Annie High who died 19th Dec 1933 and of their son William, Trooper, 9th Lancers killed in action at Roodepoort, S. Africa 24th April 1900. 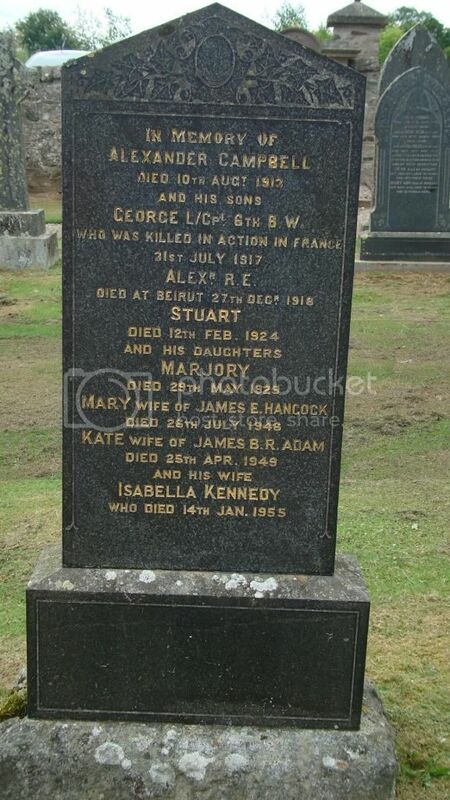 Jessie Ann MacDonald, wife of Andrew Lamont who died 8th Dec 1953. 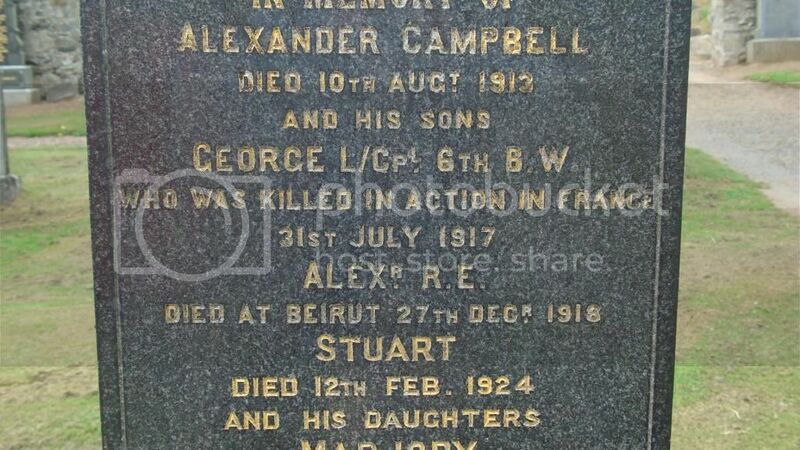 The above Andrew Lamont who died 20th Feb 1958. 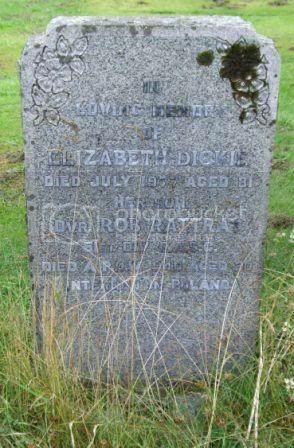 Janet High who died 28th Jan 1920. 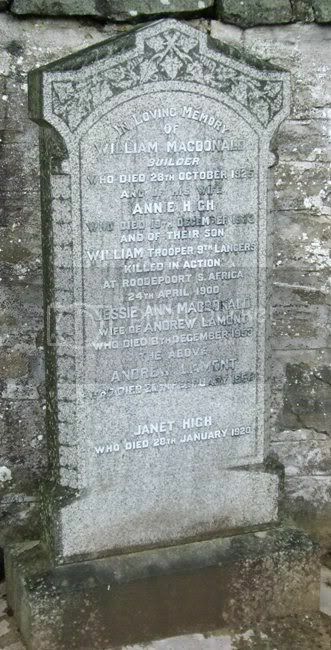 In loving memory of Annie Jack wife of John MacKay MD born 2nd April 1856 died 5th March 1897. 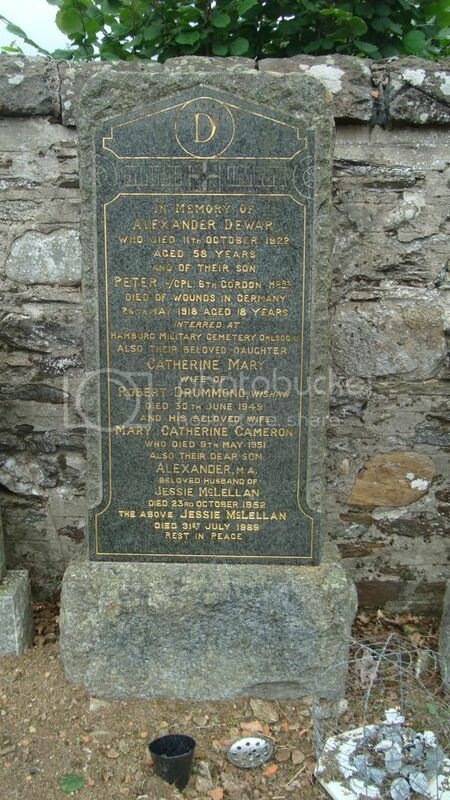 Their daughter Marguerita Annie (Rita) born 28th Oct 1887 died 12th Dec 1901. The above John MacKay JP, MD, LRGS, LRCP born 6th Sep 1846 in Tongue, Sutherlandshire died 10th June 1934. His brother David James MacKay MB, CM born 1859 died 1892. 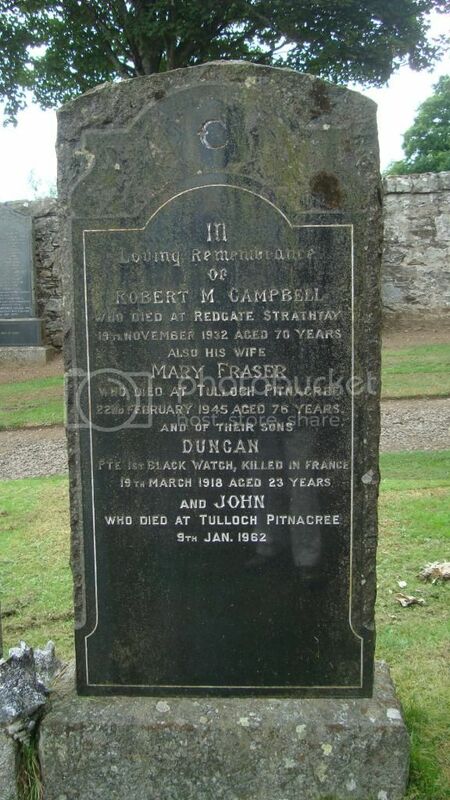 Also Marion Jack, second wife of John MacKay MD born at Dunkeld 12th June 1863 died at Aberfeldy 14th May 1940. Ian Douglas MacKay son of N Douglas MacKay MD who died 11th April 1940 aged 16 years as the result of an accident and was cremated in Edinburgh and his sister Annette Dorothy MacKay wife of Peter Bennett died in Leatherhead 9th April 1955 aged 32. 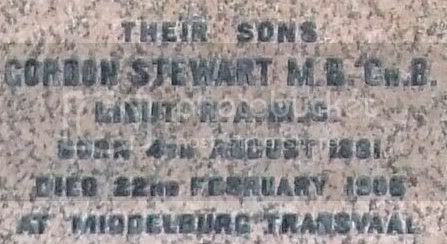 Their sons Gordon Stewart MBChB Lieut RAMC born 4th Aug 1881 died 22nd Feb 1908 at Middelburgh, Transvaal. Ronald Grahame, Student of Medicine born 17th June 1884 died 30th March 1904 at Halfontein, Orange River Colony. 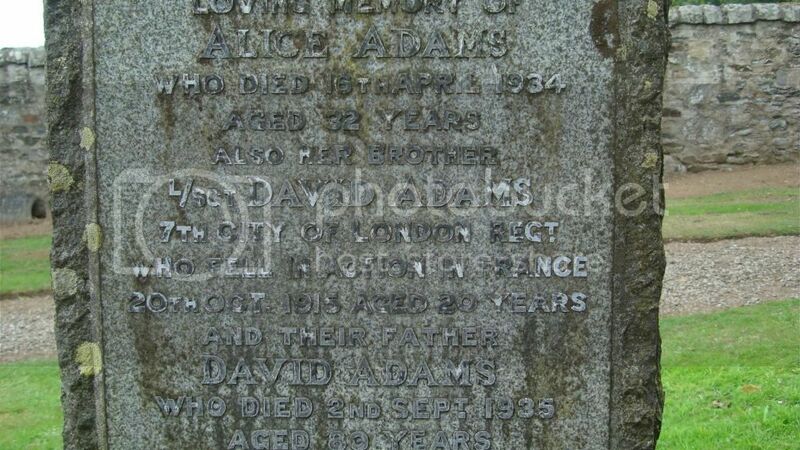 Alan Jack born 19th Jan 1886 died 29th Jan 1901. 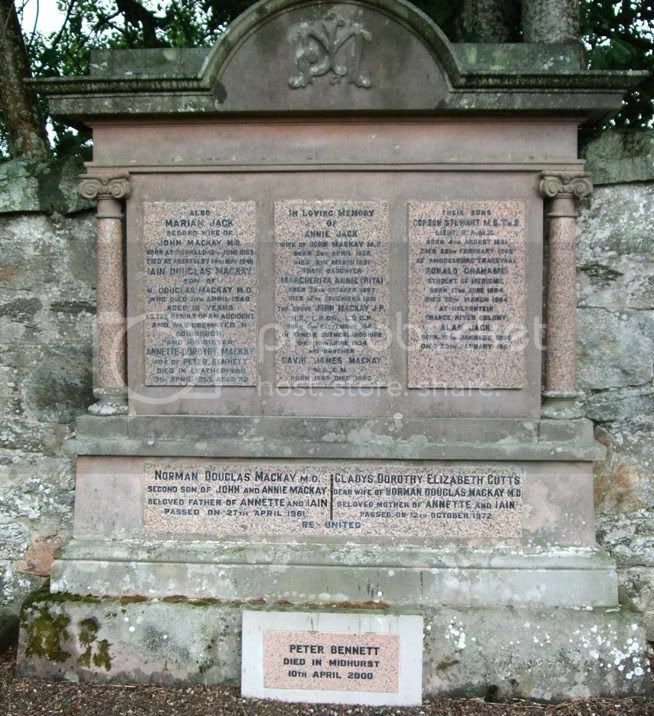 Norman Douglas MacKay MD, second son of John & Annie MacKay beloved father of Annette & Ian passed on 27th April 1961. Gladys Dorothy Elizabeth Cutts, dear wife of Norman Douglas MacKay MD beloved mother of Annette & Ian passed on 12th Oct 1972. Re-United. Peter Bennett died in Midhurst 10th April 2000. 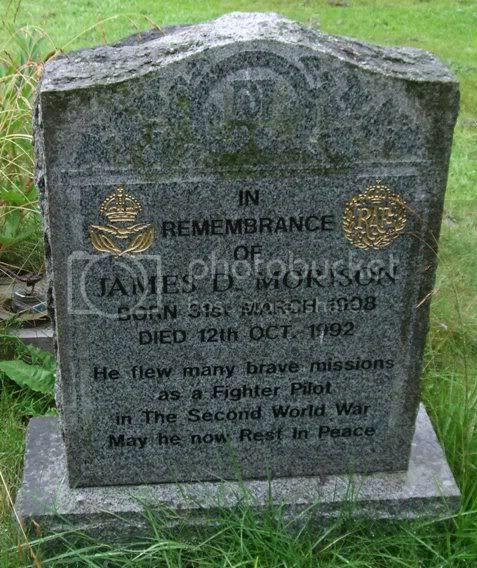 In remembrance of James D Morison born 31st March 1908 died 12th Oct 1992. He flew many brave missions as a Fighter Pilot in the Second World War. 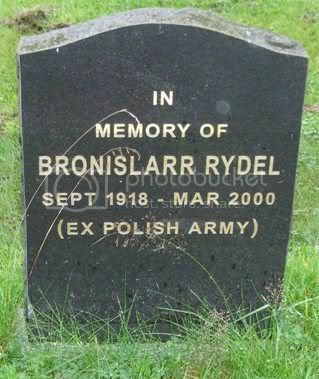 May he now rest in peace. Regiment/Service: London Regiment 1st/7th Bn. Panel Reference: Panel 130 to 135. 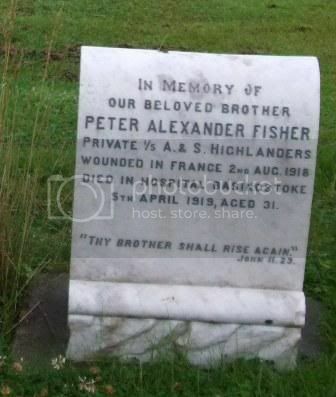 Son of David and Jane Ann Adams, of Annesley Cottage, Aberfeldy, Perthshire. Regiment/Service: THE BLACK WATCH (ROYAL HIGHLANDERS) 1st Btn. Regiment/Service: Royal Engineers4th Field Sqn. 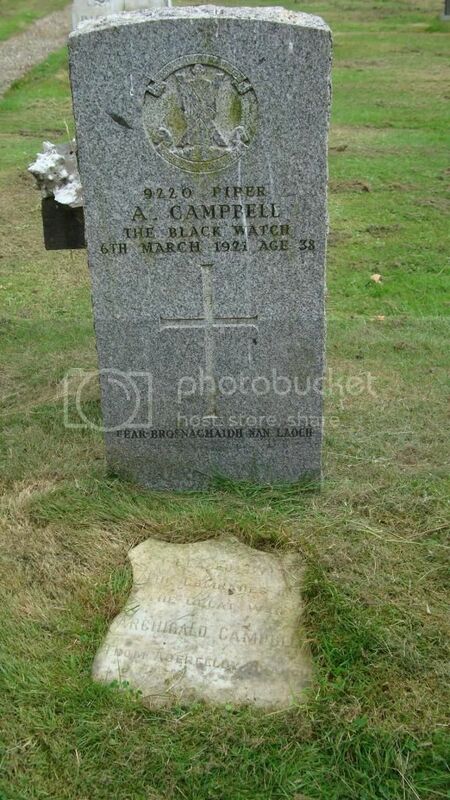 Son of Isabella Campbell, of Glencona, Aberfeldy, Perthshire, and the late Alexander Campbell. Regiment/Service: Gordon Highlanders 1st/6th Bn. Grave Reference: III. H. 8. 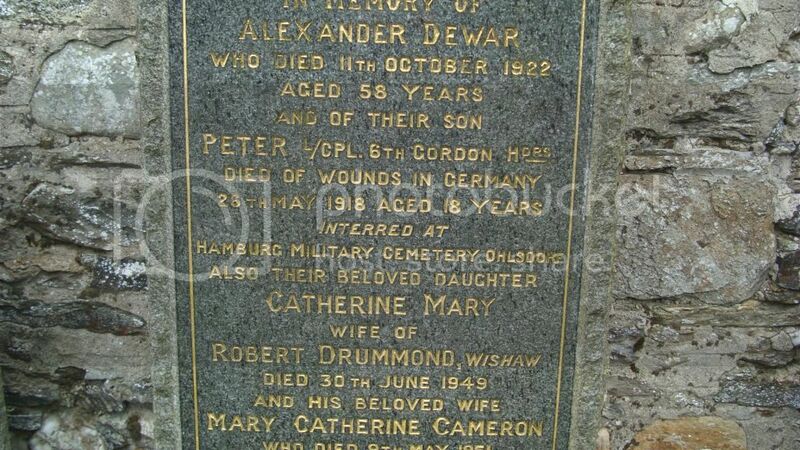 Additional Information: Son of Alexander and Mary Catherine Dewar, of Ashville, Aberfeldy, Perthshire.